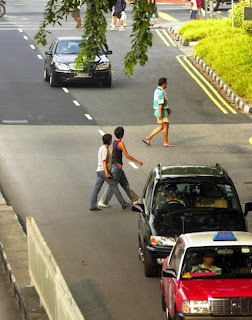 I believe that every asian countries that you have visited, most of them does not fine these jaywalkers and it was a common sight that everyone is crossing from every corner of the roads. However, Singapore decided to put strict laws onto Jaywalking. A law was passed down on 14th July 2004 to stop commuter from jaywalking, a act which has been said to be reckless and dangerous for on-road drivers. The implementation of a fine was to use monetary loss of a commuter to reduce the rising accidents caused by jaywalking. Jaywalking is defined as crossing the road within a 50 metres crossing zone. This includes crossing in a junction without waiting for an indicative signal or crossing a road in a prohibited areas. While jaywalkers can be fined twenty dollars on the spot, they could also be charged and fined up to $1,000, or jailed up to three months. Repeat offenders may be fined up to $2,000 or jailed up to six months. The police generally target locations randomly during Traffic Police Operation and commuters can be fined $20 on the spot. In 2011, 8,650 people were caught jaywalking, a whopping $160,000 for just crossing the road without proper manners !